RK Elite isn’t what you’d call an open club. The brands, teams and personalities receiving this honor are the best of the best, plain and simple. It’s no coincidence that everyone who makes the cut already eats, sleeps and breathes our core values: craftsmanship, heritage and passion for excellence. THINK YOU MIGHT BE RED KAP ELITE MATERIAL? 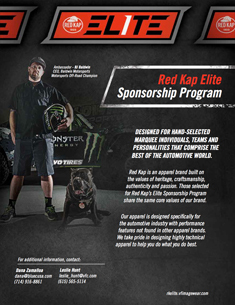 Fill out the below form, and an RK Elite Sponsorship team member will follow up with you. Attach any additional information, i.e. Sponsorship Proposals, here.